A beagle is one breed of dog. The definition of a breed is a group of animals that has a specific characteristic or trait. 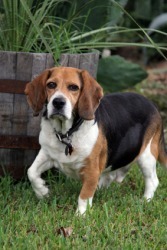 The beagle is an example of a dog breed. To breed is to cause reproduction by controlled mating to achieve a desired trait, or to cause something to happen over time. When you mate two dogs together in order to create a pure bred dog, this is an example of a situation where you breed dogs. When you foster resentment over time by constantly complaining, this is an example of a situation where you breed resentment. "breed." YourDictionary, n.d. Web. 21 April 2019. <https://www.yourdictionary.com/BREED>. To rear or train; bring up: a writer who was bred in a seafaring culture. To be the place of origin of: Austria breeds great skiers. To produce (fissionable material) in a breeder reactor. To originate and develop: Mischief breeds in bored minds. Offensive A person of mixed racial descent; a half-breed. Middle English breden from Old English brēdan ; see bhreu- in Indo-European roots. To produce or reproduce by giving birth or hatching. To raise animals or plants, often to produce new or improved types. To produce offspring sexually; to bear young. To give birth to; to be the native place of. To keep animals and have them reproduce in a way that improves the next generation’s qualities. To arrange the mating of specific animals. She wanted to breed her cow to the neighbor's registered bull. To propagate or grow plants trying to give them certain qualities. He tries to breed blue roses. To take care of in infancy and through childhood; to bring up. To yield or result in. To educate; to instruct; to form by education; to train; sometimes followed by up. To produce or obtain by any natural process. All animals or plants of the same species or subspecies. (informal) A group of people with shared characteristics. People who were taught classical Greek and Latin at school are a dying breed. From Old English bredan, related to English brood, cognate with German brüten. To produce offspring; give birth to or hatch. To cause to reproduce, especially by controlled mating and selection: breed cattle. To develop new or improved strains in organisms, chiefly through controlled mating and selection of offspring for desirable traits. To inseminate or impregnate; mate with. What breed do you raise? The native breed of mules is remarkably fine. The blue eyes -and the white coat of the kitten indicate that the Siamese breed is a semi-albino, which when adult tends towards melanism, such a combination of characters being apparently unknown in any other animal. The most remarkable feature about the breed is that the young are white. - Skins Of The Striped Domestic Cat, Giving The "Ticked" Breed And A Partially Albino Specimen.